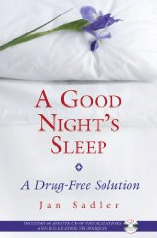 A drug-free solution to a good night’s sleep is something everyone wants and needs. Jan Sadler in her latest book, A Good Night’s Sleep published by Healing Arts Press, combined with the helpful 65-minute bonus CD, outlines techniques to ensure that you can get that quality rest your body and mind need to live a dynamic, busy life with energy and vigor. Sadler focuses on some of the reasons we fail to sleep well in today’s society and why many need insomnia help. The stressful days, mental weariness without physical activity, poor sleeping habits, and other factors are addressed. A sleep diary is provided to help you track and identify the reasons your sleep is not providing the renewal, refreshing rest you badly need. Each chapter of the book contains simply, easy-to-perform exercises which will help you develop the skill of dropping into deep, peaceful sleep easily. Each exercise focuses on solving and releasing tensions and thoughts which were identified and discussed in depth during that chapter. Most exercises require only a few minutes but have a huge payoff in getting better sleep. As you learn the skills and techniques outlined chapter by chapter, you’ll find yourself building a “sleep toolbox” that you can turn to each bedtime to prepare your mind and body for extremely deep, restful sleep. A complete bedtime routine is also outlined to give your sleep time the best beginning possible. You also get a great CD as a bonus with this book so that you can pop it into the bedroom stereo and experience being lead through each of eight important exercises, ending with the bedroom routine exercise, to ensure you rest optimally and awaken refreshed and raring to tackle the new day. This book is for anyone who has any difficulty resting well, getting to sleep, or staying asleep. Even those who think they are enjoying good sleep can improve the quality of their sleep and find even more energy and pep they didn’t know they were missing. Any adult can benefit greatly from this short 115 page book and bonus CD. Don’t miss out on this helpful guide to better sleep without medications. The techniques really work and the CD is delightful to listen to as it leads you through relaxation and visualization techniques, placing you into the proper mindset for deep, sound drug-free sleep.